Six months ago I was looking for a fun board game to play with my seven year old son so I walked into a game shop and asked for some advice. I walked out with a copy of the base set of X-Wing along with some assurances that as long as I kept it simply my son would love it. Wow did that guy give good advice as X-Wing turned out to be a blast. Soon my brave rebels were being gunned down by the evil Imperial Scourge, my son grinning wildly as his TIE Fighters mobbed me whilst he hummed the Star Wars theme. I have to admit that since then we’ve both become wildly addicted. What the guy in the game shop didn’t tell me was the Fantasy Flight Games is like crack cocaine for geeks (or even non geeks for that matter). It’s quite breath taking what you can add to this game, the first seven waves of expansion ships have so far encompassed all of the classics from the Falcon to Bossk’s Hound’s Tooth. Soon the eighth wave will add ships from the new Star Wars Rebels series such as the iconic Ghost. Then the accessories are never ending, from play mats to make you feel like you are battling above the Death Star or in deep space to high quality acrylic counters to replace the basic set you get with the core game. But let’s start at the beginning – the base set. 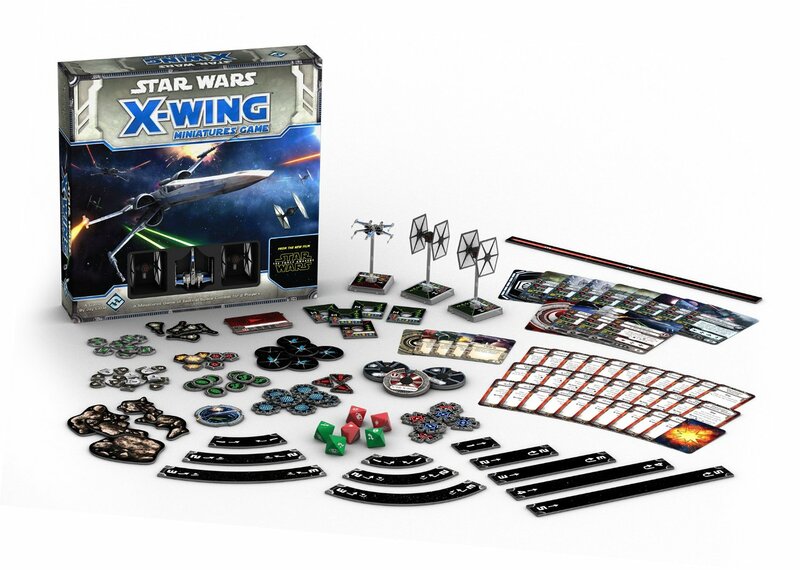 You get three model ships with this set, two TIE fighters and one X-Wing along with all of the cards and counters necessary to play. These ships are not just counters, they are a piece of art, each one perfectly sculpted and painted to a high standard. For each ship you have a choice of pilot cards, including Luke Skywalker for the X-Wing and each card has its own points cost with higher cost cards having special abilities or actions. You also get a set of high quality dice. Most forums will advise you to actually buy 2 base sets when you start playing the game and that seems wise advice. Four TIE’s vs. two X-Wings is a fun game with enough chaos to make it more unpredictable and the two sets of dice becomes useful as you add expansions which contain more complex ships. The game itself is a pretty simple concept. Each ship has a dial which outlines what moves it can make and each player sets their dial at the start of each turn. As these get turned over the game comes with set movement rulers that are then used to move your ships around the board and then players can choose an action, so target locking another ship for example which then allows you to reroll dice if you attack it. For your first few games I would simply worry about movement and shooting; even this basic version of the game is just great fun and a great way to introduce younger players. Then slowly introduce the more complex rules over time until it all comes naturally. Why is it quite so fun? Well at its heart X-Wing is just a good old fashioned dog fight. It’s all about out maneuvering your opponent, trying to guess where he’s going to move and trying to get into his blind spots with all guns blazing. You make the wrong move and your ship may take two more turns to turn and get back into play whilst his wingman is shot to pieces by the enemy. It’s simple but by god it’s entertaining and it totally captures the feel of Star Wars, you can hear the sound of those TIE’s as they zip across the table. The pace is frenetic, although it can slow down if you play larger games and add in more ships when it becomes more strategic. But no matter how many expansions you buy and how much you expand your fleet you can always choose your own pace of game by the ships you play, be that a quick thirty minute game or a multi hour epic using some of the huge ships like the Tantive IV. 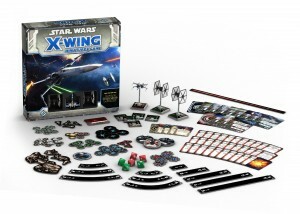 To celebrate the release of The Force Awakens, Fantasy Flight Games have now also released a second version of their base set with new Force Awakens X-Wing and TIE’s. The new versions are beefed up with extra shields and new up to date color schemes but the basic game is the same.